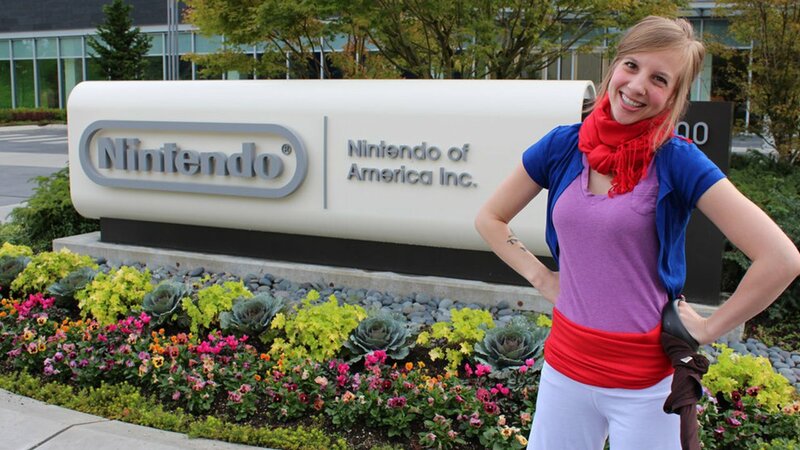 Former Nintendo marketing officer Alison Rapp made a number of tweets Wednesday evening informing her followers of her termination, stating that she was no longer deemed “a good, safe representative of Nintendo”. Rapp claims Nintendo made their decision based on her vocal thoughts about feminism, which resulted in her being targeted by people on gaming forums and places such as 4Chan and Reddit. The tweets that followed from her details her side of what happened. They were collected and posted in a thread on NeoGAF. 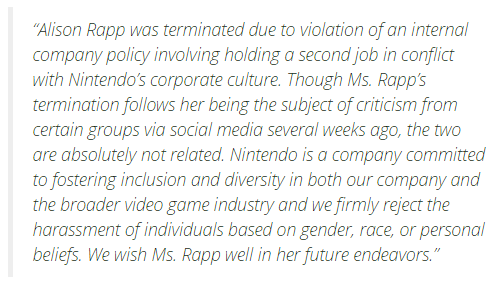 Since then, Nintendo released an official statement about Rapp’s termination, stating it was to do with a conflicting second job and not the online criticism. Rapp posted about the second job as well, claiming that having a second job (moonlighting) is accepted at Nintendo and is part of their policy. She stated she took a second job in order to pay off her student loans but did so anonymously. Ever since the announcement, many high-profile individuals in the industry have shown their support online for Rapp and called out Nintendo for not standing up for her when she was the target of online harassment. Rapp has also stated that she is seeking new opportunities in Seattle. Incredibly disappointed w/ a company I've admired since I was very young. 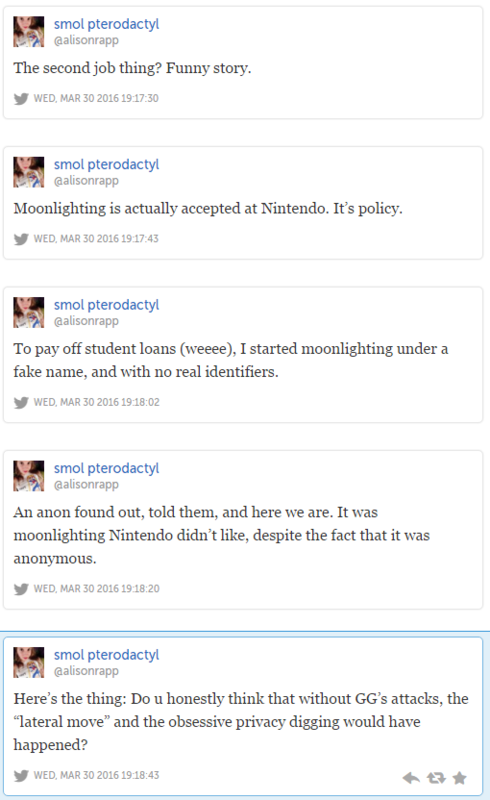 @NintendoAmerica shame on you for not standing behind @alisonrapp. Back in August, Chris Pranger, a Nintendo of America employee, was purportedly fired for appearing on the Part-Time Gamers podcast. This was supposedly done without permission.